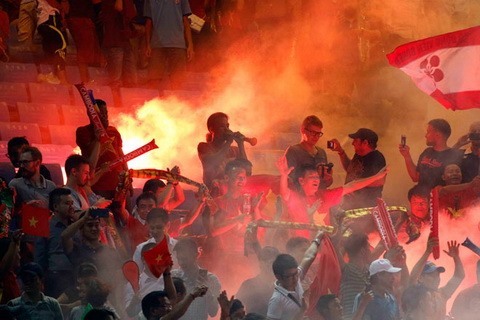 HÀ NỘI — The Asian Football Confederation (AFC) has fined the Việt Nam Football Federation (VFF) US$15,000 for failing to stop Vietnamese fans from lighting flares during the 2019 Asian Cup qualifier against Cambodia at Phnom Penh Olympic Stadium in September, the VFF confirmed yesterday. Việt Nam won the match in question 2-0. Several flares were set off after visitors took the lead just four minutes into the match, with only Vietnamese fans involved.